1. Preheat the oven to 200ºC, gas mark 6. Beat the butter with the fresh herbs and some seasoning. Lift up the breast skin of the chicken and push the herb butter under as far as possible, then flatten down the skin. 2. Heat the oil in a large (to neatly fit the chicken) flameproof casserole and brown the chicken on all sides. Add the whole garlic cloves and wine (or water) and bring to the boil. Cover and cook in the preheated oven for 1-1¼ hours until cooked through, with no pink meat and the juices run clear when a thigh is pierced with a skewer. 3. Remove the casserole from the oven and place the chicken on a warm dish. Cover with foil and leave to stand. Pour the juices from the casserole into a gravy boat, leaving a couple of tablespoons behind in the casserole, and set the gravy aside, kept warm for serving. Mash the garlic with the juices left behind in the casserole, then stir in the shredded greens. Cover and heat on the hob for 3-4 minutes, until the greens are just tender. 4. 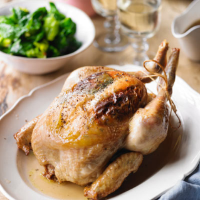 Carve the chicken and serve together with the braised greens and warm gravy. This recipe was first published in Fri Feb 28 10:22:50 GMT 2014.